Depression is a natural emotion, and it is undeniable that dogs have emotional ups and downs. A study by University of Portsmouth has found that emotions like pride, embarrassment, shame and jealousy have been observed in dogs and other domesticated animals (e.g. cats, horses, rabbits, hamsters). As depression is another natural emotion, we can quite safely assume that dogs can suffer from depression as well. Luckily, dogs mostly live "in the moment" and many dogs can get out of depression after a while. But if a dog cannot recover from depression, it can lead to physical ailments due to a weakened immune system, so if your dog seems depressed, monitor his behavior closely. This article looks at the warning signs and causes of depression in dogs, and how to use home remedies as natural antidepressants for dogs. When dogs are depressed, they usually look sad and mopey, they are withdrawn and sleep most of the time. They tend to lose interest in even their favorite toys, games, and - believe it or not - their treats! But of course even if your dog is showing some of these signs, it does not automatically mean that he is depressed, since some health problems can also cause your dog to feel and look that way. It is therefore important to get your dog to the vet if the symptoms persist. According to Dr. Raymond Van Lienden, DVM, a veterinarian at The Animal Clinic of Clifton, Va., change is almost always the cause of canine depression. "Change" doesn't have to be big and dramatic. It could be a sudden change in daily routines, or kids going back to school after the summer holiday, etc. Even seasonal or climate changes can trigger depressive emotions in dogs. Moving to a new home, new city, new country, and so on (anxiety). 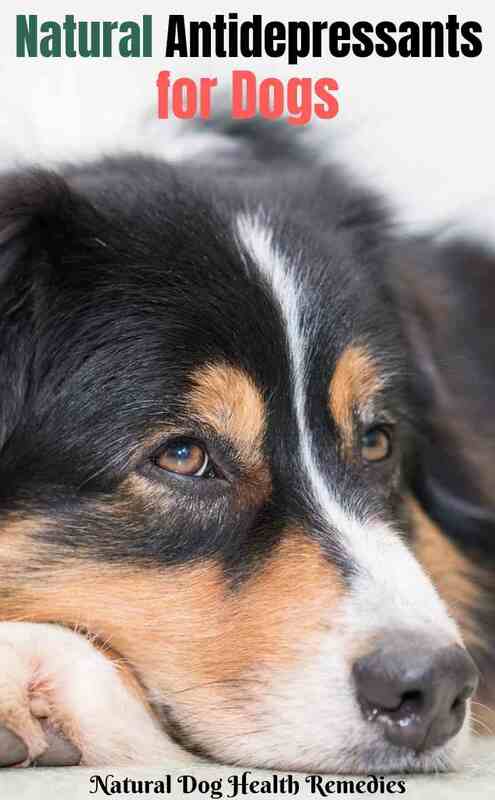 Very often, physical problems in a dog can trigger symptoms of depression in dogs as well. This could be more visible in older dogs. When my old dog suddenly lost her hearing, she was visibly anxious and depressed at the beginning. It seemed she had suddenly lost that "spark" in her eyes. Older dogs also tend to have more aches and pains, such as joint and arthritic pain, and chronic pain could cause depression. So, if there is a sudden change in your dog's emotions or behavior but there has been no environmental changes, it may be that he has a health problem. Make sure that he is checked out by a veterinarian. Sometimes dogs who are always left alone, or who have nothing to do and are not exercised or entertained enough will develop depression as well. We all know that exercise triggers the release of endorphins (the "happy hormones"). It follows that if a dog doesn't have enough exercise, he cannot have that good positive feelings brought on by endorphins. If your dog is a couch potato and hardly exercises, he is more prone to depression! So be sure to encourage your dog to exercise on a daily basis. 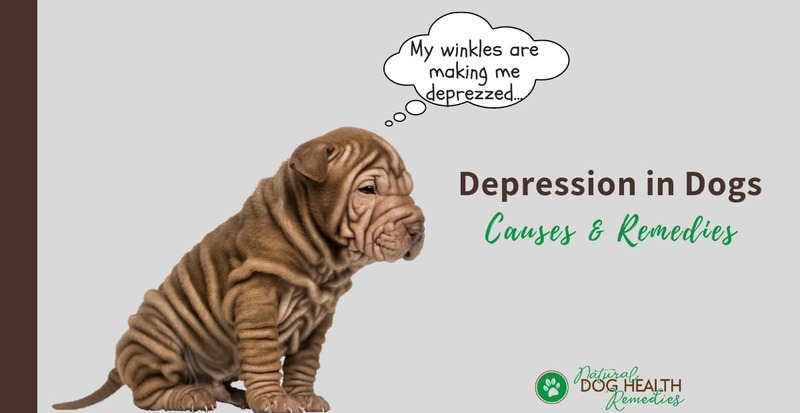 While depression in dogs can be treated using anti-depressants such as Prozac and Zoloft, there are also a host of natural remedies, such as herbs, flower essences, and homeopathic remedies that are extremely effective in lifting the spirits of depressive dogs. These natural remedies are safer and milder, and they do not have the side-effects of conventional anti-depressants. They calm, soothe, and help the dog feel better without making the animal "crash" or groggy. The herb St.-John's wort has been used for a long time with good results on people suffering from depression. It can also be used safely whenever your dog feels depressed, anxious or tense. Sandalwood is also commonly used to treat depression. The essential oil of sandalwood has a relaxing influence and is safe and gentle for dogs. Additionally, this oil has antifungal, antiviral and antibacterial functions! 100% pure sandalwood oil is expensive - a safe and cheaper alternative is to use the hydrosol of sandalwood. Spritz the coat of your depressed dog and the air with the hydrosol to lift his spirit! Flower essences are also effective in lifting the spirits of depressive dogs. There are several choices of remedies to use, depending on the cause and symptoms of the dog. Use Gentian if your dog has given up hope and shows no interest in food, especially after the loss of a companion. Use Gorse when the symptoms are more extreme than those for which Gentian are appropriate. Use Honeysuckle if your dog has become depressed after moving to a new home and is having difficulty in adjusting to new circumstances. Use Star of Bethlehem for shock (mental, emotional, and physical), e.g. shock following accidents, traumatic events, and grief. Finally, if your dog has become depressed for no apparent reason, try Mustard. It is good for dogs that are lethargic, with downcast eyes and ears. Pet Essences Depression / Grieving Flower Essences is a flower essence blend combines the power of Honeysuckle, Mustard, as well as other natural flower essences and is effective for dogs experiencing feelings of sadness, melancholy, grief and depression. If your dog has become depressed due to grief (e.g. loss of a family member), try giving him the remedy Ignatia, which is very effective in helping dogs shake their grief. Dogs needing this remedy sleep a lot and may not eat. You can give one or two drops of this remedy (30C) to your dog for 2 to 3 days. If he does not feel any better, consult a holistic vet before going up to the next higher dose. Perhaps the most important thing that we should do to help a depressed dog is to show him love and care. Spending more time playing with the dog, taking long walks together, and bonding with the dog can greatly help lift his spirit. If your dog is griefing the death of another dog in your family, consider replacing it with a new dog. If that is not possible, try to let your dog socialize with other dogs (at a park, or doggie day care, etc.). Sometimes, dogs get depressed if they are not mentally challenged enough. If your dog is moping around feeling bored, get him some interactive toys. These toys allow a dog to use his brain, and the best part is, the dog gets rewarded with treats!